Voice of the Customer. The Visible Banking team invited a banking customer and social media user to review the Commonwealth Bank of Australia facebook page. If you are a regular reader of the Visible Banking blog, you know how keen I always am to find more valuable and insightful ways to cover social media in financial services. We aim to provide the most comprehensive insights on twitter and facebook via our Visible Banking Twitter Watch and Visible Banking Facebook Watch where we track respectively over 3,000 accounts and over 1,500 pages in 88 countries. In 2012, I was delighted to introduce the customer voices section where my team reach out to real banking or insurance customers based all over the world, with various levels of usage of social media (from occasional to super active). We invite them to share their personal, unbiased feedback on some of the highest profile or most innovative social media activities and accounts from the global financial services industry. You will find below Graeme’s views on the Commonwealth Bank of Australia facebook page. Christophe Langlois and his Visible Banking team have invited me to take a look at the Commonwealth Bank Facebook page and share some of my observations about the page. Though I do some regular work in the SEO field, I am by no means a social media expert. This is simply an honest opinion as a banking customer myself and what I see in their social media banking page as a facebook user. The Commonwealth Bank Facebook page initially seems like a typical page that helps to promote their business, but the twist is that it does it a fun and engaging way. 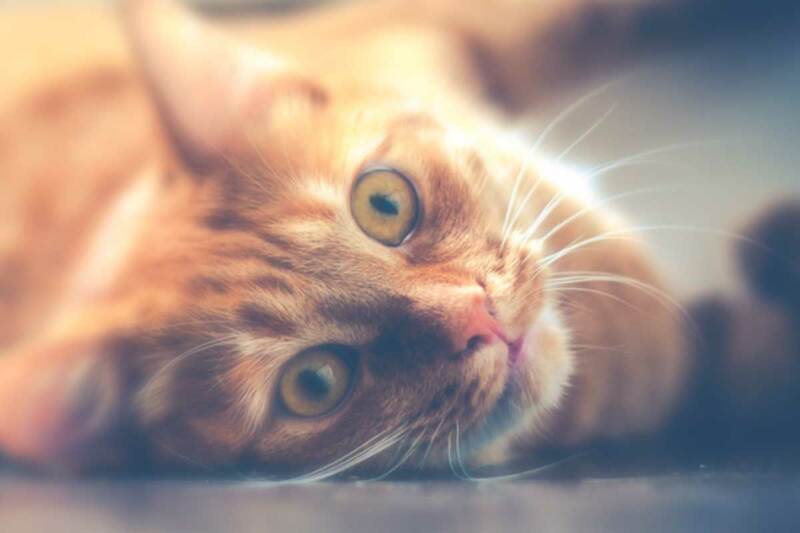 Unlike other businesses, Commonwealth Bank actually communicates regularly through their Facebook page and utilizes it as a means of resolving potential customer service issues before they spiral out of control. This makes the Commonwealth Bank Facebook page a leader when it comes to social media banking because there is a sincere desire to make sure that each customer is satisfied with the services they are receiving. As for content, what is unique about the Commonwealth Bank Facebook page is that there is added value in the information that is posted for their consumers. Many social media banking pages simply talk about services, accounts you could open, and the benefits of using their bank over a competitor’s bank. give you strategies to come up with an effective budget. 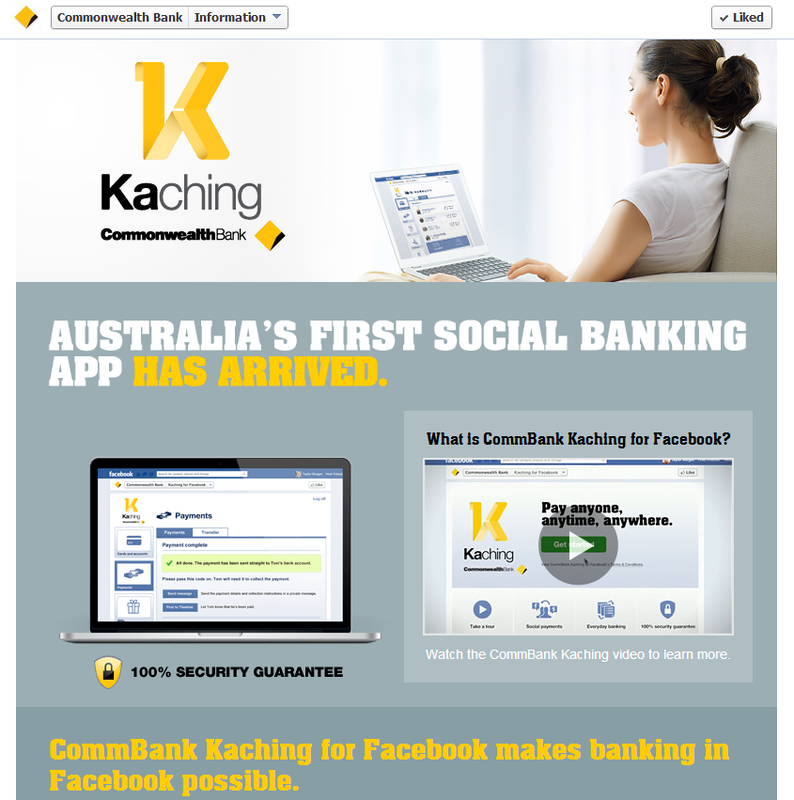 The Commonwealth Bank Facebook page provides a service that they call “kaching”, which is the social way to send money or even pay your bills. There are informative videos that help describe how kaching can help you take control of your money, help you pay using mobile devices, and not have to leave to a different website to manage your funds. This tab is definitely a 10 out of 10. As a downside, the Commonwealth Bank Facebook page also has an inactive tab for their Snap Up a Holiday promotion that if initially accessed would create a poor first impression for a first time user of the Facebook page. Overall, however, the kaching page makes for a positive social media banking experience. The Commonwealth Bank Facebook page makes an active attempt to engage with their customers and provide them with valuable content that they can use, which is definitely a positive. On the negative side, the page itself has moments of soul, but tends to be more structured using what seems like stock business images. This makes it feel less personal overall. Commonwealth Bank does regularly engage their users in a positive and helpful way, which helps to dispel any of the negative feelings someone may get from the images. Overall I would rate this page a 7 out of 10. I have not continued to like the page just for the fact that there isn’t much in personal value to me as much of the content is geared mostly toward a local Australian audience. I’m a bit old school when it comes to banking – I still actually go to the bank! I would definitely recommend the page to family and friends who were looking for a social media banking page on Facebook as it is. I’d also recommend it to other institutions who were thinking about using a similar banking service as an example of where the bar has been set high. I’m not eligible to bank with Commonwealth, but if I were, the setup of the page would make me consider a business relationship with them. I didn’t have any perceptions going in about the organization, but what I got from the page is that they are making an effort to communicate in a way that some of their clientele prefer. If this page were my page, I’d try to give it a little more “soul,” as we say here in the Pacific Northwest of the US. It’s very impersonal, with what looks like mostly stock images. That one post about the superheroes – that was nice. I’d want more of that. Graeme is a US citizen in the 22-34 age group, he regularly utilizes Facebook & Twitter, and he is independent sales copywriter. In the last couple of years, under the leadership of their now former Chief Marketing & Online Officer -Andy Lark (@kiwilark)-, Commonwealth Bank of Australia became unarguably one of the most innovative banks globally on social media, digital banking and mobile payments with initiatives like ‘Kaching’, ‘IdeaBank’ or ‘Signals’. 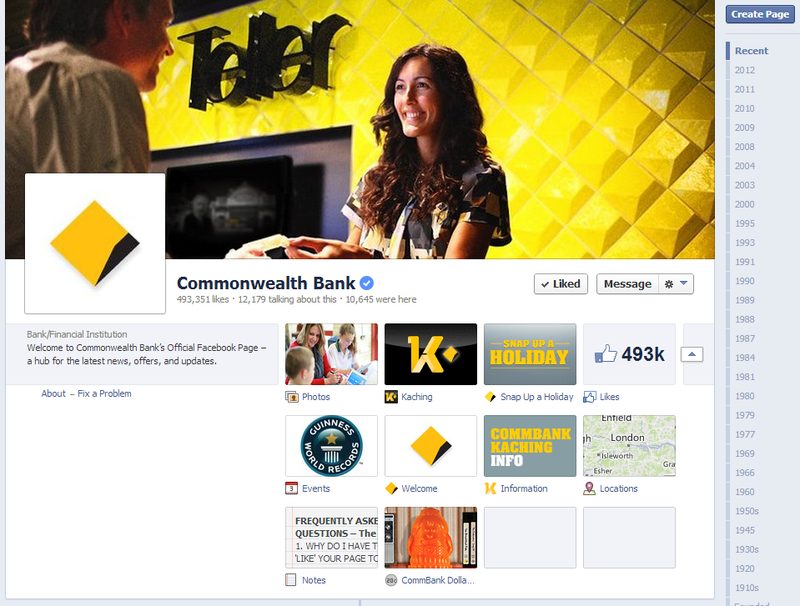 Have you visited the Commonwealth Bank facebook page recently? If yes, do you share Graeme’s views? We invite you to tell us what a bank should do to successfully engage with you on facebook. Join the conversation here or on twitter.